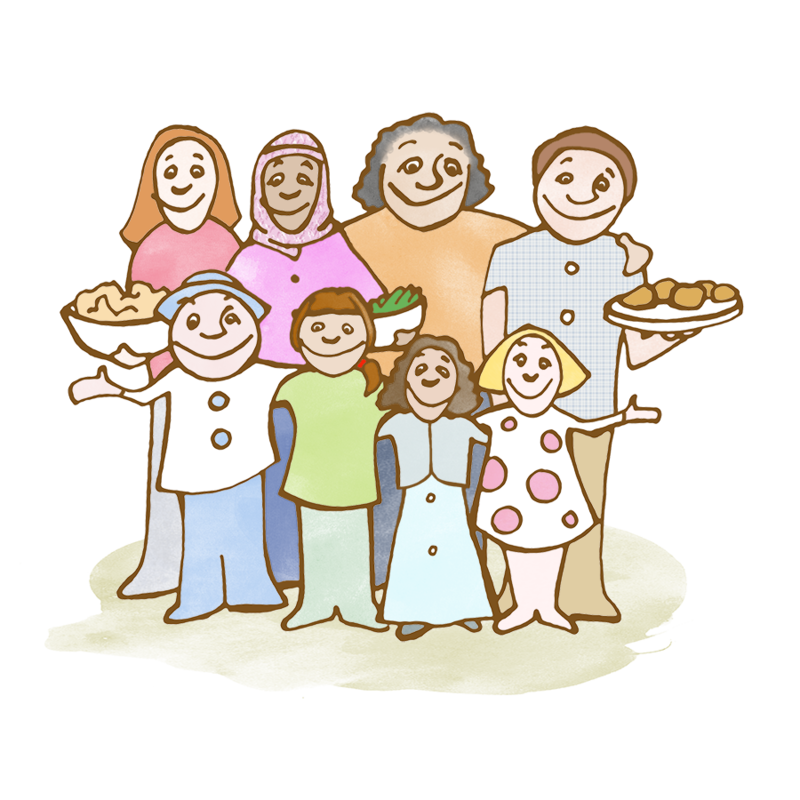 New FREE "Martin & Sylvia" Collection: "The Welcoming Feast"
We have just created three new Martin & Sylvia stories, in which they make friends with a delightful Muslim family who is new to town. The stories portray a moment of coming-together, of welcoming those who may seem - at first - to be quite different. This work a collaboration between Sparkle and many generous Muslim families. Thanks to all who helped us with suggestions, ideas and feedback! All three stories are free. When I was 17 years old, I lived in Tunisia, a lovely coastal country in Northern Africa. (I'll tell you more about this in Friday's newsletter.) I was hosted by a generous Tunisian family - and I was offered a lovely window into life in a Muslim country. I am consistently saddened by the pervasive negative "stories" in the United States media and current political campaigns, the stories that generalize the Muslim people, culture and religion into one box -- one very narrow and frightening box. We at Sparkle want to tell a different story, one we deeply believe is true. That is: we are all one human family. We may seem different on the surface, but we all come from the same origin, and share the same small planet. We are all just people. We are proud to offer stories that remind us of the beauty in our connectedness, and of the truth that the deepest healing comes through love and open-heartedness. Martin & Sylvia and the Welcoming Feast! A story in three parts centered around the first meeting between Martin and Sylvia's family and the family of Daddy's new colleague, Rami Hadid. When the Hadids all visit on a Saturday for a shared meal, brother and sister learn a little about a day in the life of a Muslim family. These stories have no Sparkle advertisement – only a short copyright tag at the end. They are intended as a gift to support families who may find them useful. Feel free to download and share or email these stories as often as you’d like. We at Sparkle give permission for them to be shared freely. Part One: "The Story of Rami Hadid"
When Martin learns that the Hadid family will be coming over on Saturday, he is initially resistant. Martin is generally hesitant about meeting new people and would rather spend the day with people he knows. But when he learns that they are Muslim and that Rami has lots of stories about growing up in Syria, he is very curious. Part Two: "Welcoming of the Hadids"
In Part Two, Martin continues to wonder what he will have in common with Lana and Sabeen, the daughters of Rami Hadid. But when they arrive, he is immediately delighted to see that Lana shares his interest in inventions. He also finds that they have something else in common: they are proud of who they are. In Part Three, the two families each share a blessing before dinner and then share stories about the family traditions they enjoy. After Martin and Sylvia's family is invited to attend the naming ceremony of Basim Hadid, their newborn third child - Rami tells a folktale about an old man and woman who changed the world by opening their doors to all strangers.